Hi im new! Im a monster hunter freedom unite girl. I do have tri but its hard playing with the remotes so i stick to the psp. I would like to go on online quests for the first time because now no-one is ever on. Im still on HR1 so ill go on quests with newbies in the game but im getting better... anyway im willing to become friends: im nice and i would like a good chat. So if u newbies out there wana go on quests with me just message me, thnx!! 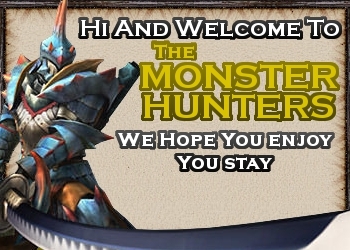 Ohhh well what about MHF2 is that online? Welcome Taloosa, good to see that you are a strong and honest player. Have fun here.